In 2019 there are more options than ever before if you’re looking for an adjustable height standing desk. In addition to more options, prices are gradually going down as well. Really, anybody who wants a standing desk can get one in 2019 and I’ve tried to put together here the best guide possible for you to help choose the best one for you. Now, there are a couple different routes you can go. You can either get a full adjustable standing desk or an adjustable standing desk converter to add the desk you currently use. Don’t worry, I’m going to give you a list that includes both kinds for every any budget you’re on. Before we get into the list though let’s look at a couple things. Is it worth investing in a standing desk? I think that video breaks it down pretty well. Look, if you sit all day long at work then it’s going to be a great idea to invest in a standing desk. Especially when people don’t tend to just sit all day at work but also tend to go home and sit for several more hours watching TV or playing on their phones. And, even if you exercise it may not be enough to counter the negative effects of sitting all day. Fortunately for you, as I said standing desks are going down in price and really anyone can get one if they want. With that said, let’s get into it. Ok, so here are the options that are going to be best for most people. When I say moderately priced what this means is basically $200-$400 for standing desk converters (more or less depending on size) and roughly $350-$700 for full standing desks. This is the area where you find a quality product that comes with a decent warranty and won’t break on you in a short amount of time. Here they are. The ZipLift really is just an excellent overall standing desk. It’s sturdy, it has good height-range that will work for most people, and it isn’t overly expensive. It also adds the option in to tilt your keyboard tray as much as 15 degrees. While standing this can really make your standing desk experience a lot more comfortable. So that’s a feature you won’t find on many other standing desks. Especially since iMovR is the brand that created that added feature to standing desks. Now, if you’re someone who only buys things that are made in America. Then iMovR is the option for you as they take pride in having selections that are entirely made in America. If you want you can go with their ZipLift “Patriot” option which is made of a 3D-laminate hardwood that is made to last for years. Of course, this option will be at a higher price range than the standard option. The standard option is going to be the best choice for most people though as the price is too good to pass up on, not only that but they’ve been throwing in a standing desk mat to go with it. This makes it a terrific buy. 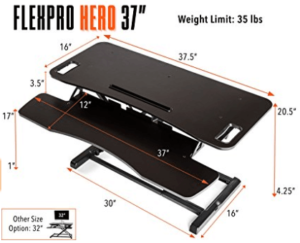 The Hero 37 FlexPro made by Stand Steady is something that just can’t be overlooked because it’s a really good standing desk, yet the price you can usually find it for is ridiculously low compared to other desks that basically have the same features. This isn’t some cheaply made standing desk either, Stand Steady has been around for years making standing desks. So you’re getting a quality product that will also come with a warranty included. Now, the price on this is going to vary depending on whether or not you find it on sale, but this really is the most affordable quality option you can find in my opinion. Really, this could be considered as a “cheap standing desk” but the quality and the original price suggests otherwise. With this standing desk, you’ll come away feeling like you got a steal for the price you paid. In addition to all of that, it’s one of the tallest standing desk converters you can find. In fact, it was designed specifically for taller users. 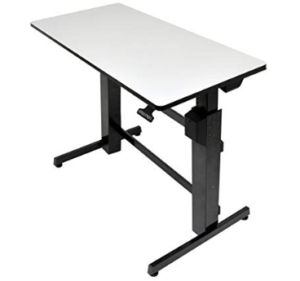 In addition to the Hero 37, Stand Steady has several “Flexpro” styles you can choose to go with including an electric option, or even a corner desk option. 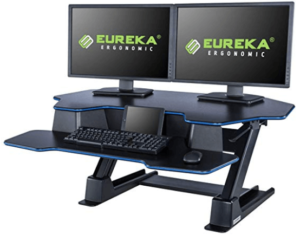 The Eureka standing desk is great because it just has a really cool look to it. 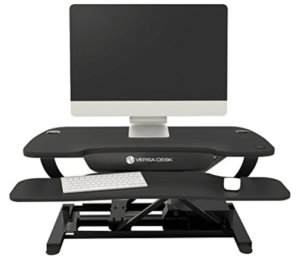 Out of all the Varidesk alternatives you can go with, this standing desk converter has a lot of the same features as the Varidesk. It has a lot of extra space on the bottom tray so that if you want you could shift your monitor down to that level while sitting, or you could put a laptop there as there is enough space to use it with that as well. Others tend to barely fit a keyboard with no room for anything else. This is an underrated feature because it gives you versatility. Not everyone likes using the top tray when sitting down, especially when we are used to having our monitor at desk height! This, like the Varidesk, allows you to utilize the bottom shelf when needed. Outside of that, the height range is actually better than the Varidesk as the top tray goes up to 20 inches compared to 17.5 for the Varidesk, so if you’re trying to decide between those 2 and are on the taller end then the Eureka desk is going to be a bit taller, mainly while standing. Now we’re talking, this is a completely different concept than the other desk converters mentioned so far. 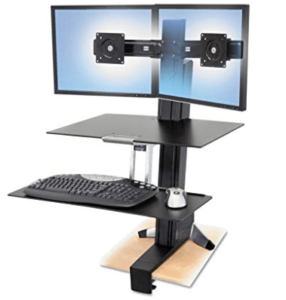 The Cadence standing desk converter is basically a monitor arm with a keyboard connected to it making it a full standing desk. This allows you to use your entire desk space for other things as any time you don’t want to use your computer you can just swing it out of the way. This is absolutely perfect for people that work in architecture, drafting, or just anyone who uses their desk for other reasons than just to type on their computer. In addition to all of that, it is very easy to adjust, in fact, it’s easier than just about any standing desk as you just grab it and shift it out of the way. There are other brands as well that mimic this style, but iMovR puts out some of the best quality products. If you’re going for this style I wouldn’t go any cheaper because the ergonomics have to be just right for this thing to last a long time, and you’ll get that from iMovR’s Cadence desk. Oh, and by the way, on top of all of that, as far as I know, it’s the tallest standing desk converter you can find that will work comfortably for someone 6’5″ or potentially even taller. The VersaDesk Power Pro is an excellent desk as it’s one of the sturdiest standing desks that you’ll find. 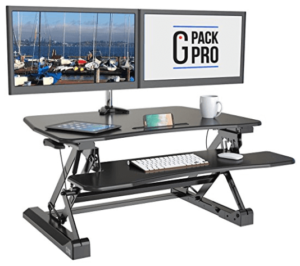 Most adjustable height standing desk converters will be lucky to hold even 50 pounds but this standing desk holds up to 80 pounds. It’s also simple to adjust because you just click a button. So you don’t have to use any strength at all even though it can hold a lot of weight. So overall, this is an excellent standing desk option if you want to have dual monitors. The adjustable height range is also very good. In fact, this is another way it really stands out. The top-level adjusts from 4.5 to 20 inches while the bottom level adjusts from 1 to 16.5 inches. This is great because while sitting the monitor level won’t be too low, but yet it reaches a tall enough height for most people and will even work for taller people (roughly 6’4″). All of these things listed makes it one of the best adjustable height standing desks you can find. Ok, I wasn’t sure whether or not to include this adjustable height standing desk, but when you think of standing desks the first brand that comes to mind is Varidesk. Even after all of these years, the Varidesk is still a favorite in 2019. I could give several ways it actually lacks behind some of the other options listed here, but the truth is for 90% of the population it is a terrific standing desk. Other brands have looked at what the Varidesk made and improved upon it in certain ways, but really there isn’t much missing from the Varidesk. As long as you’re not taller than 6’1″ you’ll probably love this desk. Like I mentioned above with how the Eureka desk is a lot like this, it has a lot more space on the bottom level than other options. I personally love this because I tend to just move my monitor down to the bottom level while sitting. I mean, think about it, we are used to keeping our monitor at desk level and one of the main adjustments is having our monitor lifted roughly 5 inches off the desk. Well, the Varidesk has enough room to move your monitor down if you want. Of course, another way around this is using a monitor arm, but that’s a whole other cost to think about. In addition to all of that it is just a really sturdy, reliable standing desk. 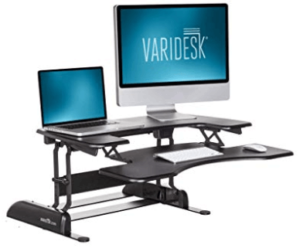 You know what you’re getting with a Varidesk. The look, the space, the originality. All of those things have the Varidesk still on this list in 2019. This one is made by Fully who sells one of the most popular standing desks you can find (the Jarvis) which we will get to here soon enough. But the Cooper is another high-quality adjustable height standing desk converter. The price on this model has actually went up a bit because it is such a popular desk converter to go with. It really is a lot like the Hero 37 desk mentioned above only built with different materials. This converter is going to be built a bit sturdier but is going to cost you more. It may just be worth the money though as even after the increase it still goes for less than a Varidesk. Oh, and by the way, it’s much taller than the Varidesk raising up to to a maximum height of 22 inches! That’s the tallest Z type (or X type) converter that you’ll find on the market as it’s even a bit taller than the Hero 37. The bottom tray goes up to 17.3 inches tall. For a desk converter, the height on the is simply top notch as it’ll work for someone roughly 6’5″. If you like this style then you can’t go wrong with this model or the Hero 37. 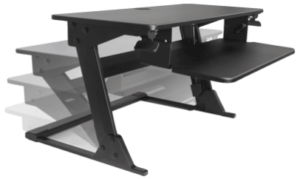 The Ergotech Freedom adjustable standing desk is another solid choice that has a price point that will be at lower end of the moderate price range listed. Now, that being said, the Ergotech’s price point tends to changed drastically quite often and I’ve seen it range from less than $140 to nearly $400 over the last year and a half. So unlike other standing desks, it isn’t really at any strict price range. 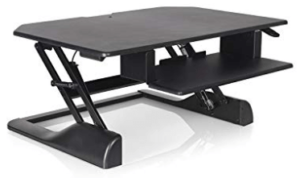 But the thing is if you can find this standing desk converter at the lower price point its one that is hard to turn down because it’s tall, sturdy, and even comes with a quality 5-year warranty. But not only do they change the price up quite a bit, they have 2 different versions. One has an ergonomic cutout on the front of the top level and one doesn’t. The one they are selling lately is called the “new improved product” but it doesn’t have the ergonomic cutout and in my opinion, isn’t as good as the original version. With this desk riser you could be taking a bit of a risk, check what price it’s going for to see if you want to take that risk or not, if it’s low enough, it may just be worth it. I originally wasn’t sure if I was going to include this standing desk, or even sure where to put it. It’s definitely a tweener. In between falling under this category or under the “cheap standing desks” category. But this is a quality standing desk converter and you’ll be hard pressed to find any negative reviews on it. It just seems that you aren’t really missing much for paying half the price of a Varidesk. And not only that but it even outperforms the Varidesk in a couple areas! For example, it’s maximum height is going to reach 19.7 inches, which is over 2 inches taller than the Varidesk. 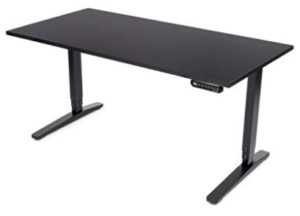 At the end of the day this desk adjusts smoothly and quickly and if you just want something simple that isn’t going to break the bank this is an option worth considering. If you want a full adjustable height standing desk instead of just a converter, then you’re going to have to spend a bit more. Now, there are a few that are still pretty good quality and aren’t overly expensive. The first one worth mentioning is the Ergopose “ePo” adjustable height standing desk. Now, the reason I’m listing this first is that it falls under a price range that I think most people want to pay when looking for a full standing desk, but it also has specs that are just as good as some of the most popular models. The height range of these desks are going to be a lot better than desk converters. For obvious reasons, as they are larger and the legs are able to adjust accordingly. Since they are built specifically for being able to be adusted up and down you’re going to get a lot of up and down movement and most of these will accommodate people up to at least 6’4″. 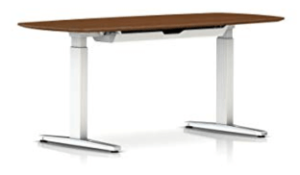 The ePo desk adjusts all the way up to 49 inches not including the desktop. Ok, so what exactly does all that mean? Well, it basically means that this desk is going to work for someone 6’7″. And that’s really at a minimum and just being modest. Really someone a few inches taller could use it but they just wouldn’t have the best ergonomics. The height range is great, and also the specs when it comes to speed, sound, and warranty aren’t too far off your higher end products, making it perfect for most people. One of the main thing I recommend with the standing desk is to consider just buying the frame and then adding on your own desktop if you’re really looking to save money. But then again, their desktops are quality pieces of wood you’ll just pay more and it will end up being comparable to other mid range adjustable height standing desks. This is going to be a step up from the Ergopose desk, and you’ll see that directly in the price range it falls in. The price range for the Jarvis desk frame tends to go for about $100 more than the ePo. They offer a 7-year warranty to go with what you’re getting as well. And that’s mainly what the difference is going to be. You get 5 years with the Ergopose and this desk will give you 7 years. That’s probably about the quality difference you’ll see as well. The main difference here is that the frame of the Jarvis will cost a bit more while the desktop of the ePo desk will cost more and overall they end up at around the same price range. Now, if you’ve been looking around for a standing desk for a while you’ve likely heard of the Jarvis by Fully because its a really popular standing desk. Mainly because, like the ePo desk, it is moderately priced for what you’re getting. People just don’t want to spend 2 grand on a standing desk, I get it. That’s why this is another option to consider. You’re getting a standing desk that’s going to last years without forking over a grand or more. Now, as for specs, it reaches 49 inches tall, moves at 1.5 inches per second, and can hold up to 350 pounds. You’ll do just fine with this adjustable height standing desk. You just can’t mention the Jarvis desk and not throw out the Uplift 900. These desks are very comparable in terms of price range and quality. The UpLift is going to give you 1 additional inch of height range. Honestly, that’s the main reason to go with the UpLift over the Jarvis. So you’re extremely tall, at 6’8″ or more then go ahead and get the UpLift 900. For the most part, I don’t think you can go wrong with either of these desks. And really there are mixed reviews on which desk is sturdier or even faster even though the specs are more/less the same. It actually has a 355-pound weight capacity while the Jarvis is 350, but outside of the rare situation that you’re Shaquille O’Neal and plan on standing on top of it, you have nothing to worry about there. The UpLift 900 desk has programmable heights and adjusts with the click of a button just like the Jarvis. This is a desk worth considering. 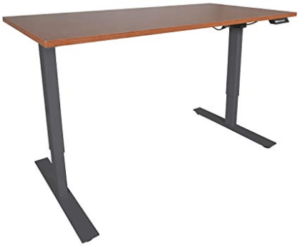 The Ergotron WorkFit D is different than any other full adjustable height standing desk I have on this page because it’s a manually adjustable desk. All of the others mentioned here (for full desks) are electrical and adjust by pressing a button. And look, for full-sized desks that is the most convenient way to adjust them. That being said, if you decide you want a manually adjustable standing desk then it will adjust a hell of a lot faster. Instead of several seconds to go from sitting to standing, you can adjust it in basically a second or two. That may not seem like a big deal, but if you’re someone that wants to switch back and forth quite a bit you may want to consider this option. Now, it won’t hold nearly as much weight as an electric standing desk because if you had several hundred pounds on it then you wouldn’t be able to move it…unless you wanted to do some heavy lifting and get a workout in. But that’s not even possible because the maximum weight capacity is 65 pounds. Just to clear though, monitors tend to weigh less than 1o pounds. So even with dual monitors, the CPU, and your weight pressing down on it you won’t have any issues with this weight capacity. The lowest setting is 30.6″ which is taller than the average desk (29 inches). The above options are going to work well for most people. But that doesn’t mean that you are most people. Some of us just want the finer things in life, and standing desks are no exception. The difference between these and the above mentioned aren’t necessarily going to be night and day differences. But you’ll tend to see less wobbliness at maximum heights combined with even longer warranties. The price on these bad boys can run anywhere from a bit less than a grand to over two thousand dollars. These are the elite standing desks. Here we go. This is the standing desk we all want to have. The Lander Desk made by iMovR, which actually used to be called the Omega Everest standing desk. Honestly, I’m not sure why they changed the name because I thought the Omega Everest was pretty much the coolest name for a standing desk. But of course, they’ve made some improvements on the desk (forget about the name). In 2019 I think this is the best adjustable height standing desk you can find. It is the tallest standing desk you’ll find…wait, that needs to be re-stated. It isn’t technically the tallest desk but it’s the best standing desk for tall people you can find. Why? Primarily because of the ergonomic keyboard tray that comes with it that can be tilted. Basically, even if it’s the exact standing height as another desk it’s pretty much like being 3 inches taller if you can tilt the keyboard tray down so you’re not putting stress on your wrists. The other thing is that they have 4-inch extensions you can add to this desk. So even though the height of the desk goes to 50.5 inches, if you add both of those factors in you have a desk made for a 7 footer. Now, if you’re not an NBA center, then this is still my favorite desk. The entire desk is made in America and is simply top of the line in every category. iMovR makes several standing desks but this is listed as their strongest, quietest, and smartest desk they have. Which I should definitely elaborate on the smart part. They have a smartphone app that goes with the desk and has all kinds of features like telling you when you should stand up as well as other stats. In addition to that, it has anti-collision technology as a safety feature as well as to protect the desk. You don’t have to get the tilted keyboard option on this desk if you don’t want as you can just go with a solid desktop. They offer a total of 8 sizes and 13 different desktop color options in total. My favorite being the 83-inch wide version. This would allow you 2 positions on the desk where on one side you could have a treadmill and on the other side you could just use it for sitting. Talk about an elite adjustable height standing desk. The Herman Miller Renew is going to cater to a specific crowd. Herman Miller is simply one of the top office furniture companies you’ll find and they are known for their elite level products. Their adjustable standing desk is no exception to their exceptional track record of quality products. Now, a lot of people may think that you’re just buying the brand name. I’m sure to some extent this is true with any product that costs double something else, but make no mistake you can expect near perfection going with this standing desk. But if you’re someone that is going to buy Herman Miller, then don’t sell yourself short and go with their veneer finished walnut top option. It is simply an immaculate standing desk. Built with hidden wire management through the legs and rounded corners. They thought of every small detail to make this standing desk the perfect desk. This isn’t for some punk kid that wants to play video games, this is for a true businessman (or woman) that wants something that lets people know they are important, or just simply wants to feel important (not that you need that). But hey, if you can, then why not? 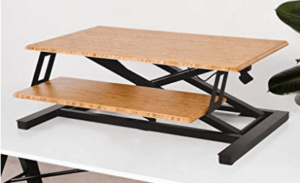 The UpDesk Pro offers a dual motor desk that isn’t going to cost quite as much as the other 2 “elite” adjustable height standing desks. They offer a quality desk that comes with a sleek looking desktop that is made to last for years. They offer a small, medium, or large desktop with each being 30″ x 48″, 30″ x 60″, or 30″ x 72″. That really covers about any size you’re going to need. Their LINAK frames are designed and tested to meet all industry standards including vertical stability under a load, concentrated load bearing, distributed stability under load, and leg strength testing. These frames are top of the line and even have a 375 weight capacity! 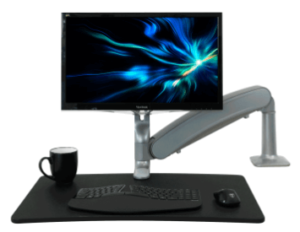 The adjustable desks are Bluetooth enabled and they offer an app as well that you can use to adjust your desk to preprogrammed levels of your liking. In addition to all of that, they raise up to 49.5 inches tall and they even offer castor wheels which used would raise your desk up to 52.5 inches making it taller than almost any other option available. Yes, I’m talking to you 7 footers. 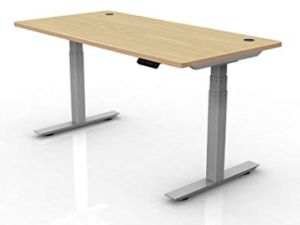 If you choose the UpDesk then it is also going to come with 2 integrated cord management channels and a mountable power strip. 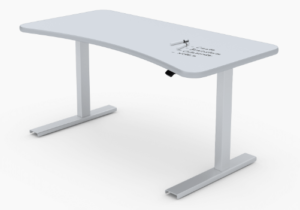 However, possibly my favorite option from UpDesk is there UpDesk UpWrite which has a desktop that you can write on. This is the perfect replacement for a dry/erase board and really is a step up for anyone who wants to be creative while they work. I wanted to include an elite standing desk converter in this as well. For the most part, there are some really good options that cost less than $400 but the WorkFit S stands out as a unique standing desk that I would consider better than your average standing desk. It adjusts so easily up and down as you can simply slide it without using too much force. 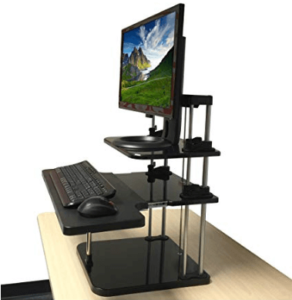 It also attaches to the front of your desk which puts in the correct ergonomic position unlike a lot of base/post standing desk converters that are made to go on the back of your desk. You can fold up the keyboard tray, you can adjust the monitor height up and down 5 inches, and it’s fully capable of holding dual monitors. It may not look like much with its compact size, but it really is the perfect use of space. It’s so simple but that’s what makes it elite. Cheap standing desks I’m sure are what a lot of people came here to find. The thing is people want to try out a standing desk but just don’t want to invest hundreds of dollars, especially if they really don’t know how much they are going to use it. Well the good news is that with these becoming more and more popular the price has gradually went down. Here are some of the cheapest, most affordable options you can find. I hate calling this standing desk cheap because it’s a really good product. Affordable is a much better word. In fact, this is the first standing desk I used at home myself. And it did its job perfectly. Now, when I look back at this desk converter I can’t believe how far the price has gone down! Recently it’s been going for far less than half of what it was when I bought it. And the thing is, it’s a great desk. It’s almost like a hidden gem that people just need to know about. This standing desk allows anybody to try one out at a ridiculously affordable price. Ok, back to the desk itself. It’s great because it doesn’t take up a lot of space. What this desk lacks is actually some of it’s greatest features. Even though its compact and small, it actually has a really good height range and will work for someone as tall as 6’2″ (I’m 6’2″ so that’s proof). Now, the monitor height may feel a little short if you’re my height, but with a little bit of monitor tilt, it will do the job just fine. The downside is that with this being smaller and not weighing as much as your typical desk converter, you won’t be able to use this if you want dual monitors. Ok, so you want dual monitors and you don’t even want to spend a hundred bucks. 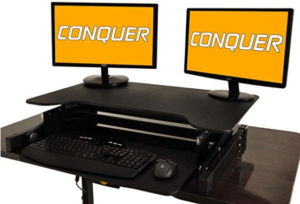 Well, the standing desk converter made by Conquer is currently your best bet. Now, with it being newer to the market and with price point where it is. I can’t guarantee this thing will be around for a long time. In addition to that, the height range isn’t very good. So if you’re tall then think again about this one. It’s only going to be tall enough for someone maybe 5’11”. You pay for what you get and don’t expect this to be exactly like a Varidesk, but overall it should do the job. It used to be that you could barely find an adjustable standing desk for less than $200. Now, these things are popping up for half that. Prices may vary of course, but at the time of writing this article, this standing desk is going for less than $100. Good God, don’t tell me a hundred bucks is too much to spend on a standing desk! Ok, you really don’t care that much about standing and just thought you’d see what’s out there huh? Well, guess what? You aren’t going to get an adjustable standing desk for much less than that. 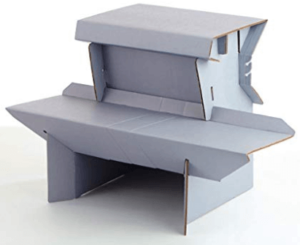 I’ve given you the cheapest ones here but if that just isn’t enough you could always go with a cardboard box as a standing desk. Is it adjustable? No. Not unless you count picking it up and moving it, which would be easy to do. But hey, if you want something affordable then go ahead and try this out. I wanted to provide one full standing desk that would be considered cheap. Now, just to be clear if you’re getting a full standing desk then pretty much any way you slice it you’re going to spend just as much as you would on a quality standing desk converter. So what I’m talking about here is basically finding a frame for under $300 and your total price (frame+desktop) being under $400. Titan Fitness came through with a great option here. They are normally known for, you guessed it, fitness products, but I suppose this would somewhat qualify as that. 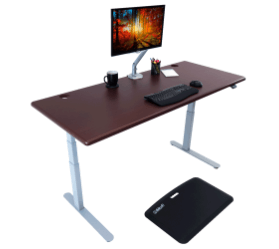 This desk isn’t going to provide you the same specs as the others I mentioned above, and if you’re trying to find a full standing desk that is affordable you may want to consider the ePo desk and spend a bit more. That being said, this standing desk works and does what you want it to do. It just won’t be as fast, won’t last as long, and won’t have quite the weight capacity. But overall, people like this standing desk because of the excellent price point. Another standing desk worth considering at this price point is to go with a desk frame made by VIVO, which you’ll find around the same price. Or if you want to go even cheaper you could look at getting a crank style standing desk. Now, to be clear, I really don’t recommend those because they are a huge hassle to adjust every time, but I wanted to at least mention that. Overall though, I think Titan makes the best “cheap” full standing desk. Ok, so here is every standing desk listed here with my rating and the price range these fall under. Keep in mind that prices can always vary but for the most part, they are going to fall in this range. The rating on each desk does not have the price included in it. On some other articles I use the price to factor into the overall rating, but the rating here is strictly based on the performance of the desk. Can standing desks help back pain? Standing desks can help mitigate back pain. Just the mere fact that you are doing something other than standing is going to help out lower back pain as a lot of that is caused by inactivity. In addition to standing, you can always do various stretches or even go as far as using a treadmill with your standing desk to help with movement. However, simply anything will help back pain compared to sitting in the same spot all day long. Is standing bad for you too? There has been some controversy on standing desks because recent research has shown standing to be just as bad for you as sitting, possibly even worse. And I think it’s common knowledge that just because you don’t want to be sitting all day long, standing all day long isn’t exactly ideal either. After all, this will put pressure on your knees, feet, hips, and really just your overall body. The great thing about an adjustable standing desk is that you don’t have to do either, you can stand when you feel you need to stand, and sit when you feel you need to it. Which makes for the ideal workday. How many calories do you burn using a standing desk? If you’re just standing then you’re really not going to burn a lot of extra calories by choosing to stand instead of sit. There have been several studies done and it seems you may burn around an extra 8 or 10 calories an hour. Now, any small amount is good for most people, right? But choosing to get a standing desk isn’t going to magically lead you to burn more calories and in turn, lose weight. Now, you can always increase that number by doing stretches or again, adding a treadmill to go with your standing desk, as that would be a game changer. Should you get standing desk accessories to add to a standing desk? You don’t have to get anything except a standing desk, I mean that’s all you really need. But at the same time if you do add some standing desk accessories then it can improve your standing desk experience quite a bit. For example, a standing desk mat will lessen the pressure on your body while standing and can help out those negative effects we mentioned earlier. Another thing that I highly recommend is an articulating monitor arm. When you go from sitting to standing you probably aren’t going to want your monitor to be in the same exact position and these are an easy way to adjust your monitor quickly and effortlessly. Oh, and again, you could get a treadmill. Is that an accessory to a standing desk or is it the other way around? Can you just get a standing desk that isn’t adjustable? Yes, if you want to get a standing desk that is always in a standing position then that is an option as well, and will probably be a lot cheaper than an adjustable height standing desk. But just like it isn’t good to sit for 8 hours you sure as hell don’t want to stand for 8 hours either, so you’ll be in the exact same predicament only the other way around if you go that route. Those really aren’t worth the money you would save and for that matter, as shown here there are several cheap adjustable height desks you can find now in 2019 so there really isn’t any reason to choose a non-adjustable standing desk. You could choose a high office drafting chair to go with a standing desk that doesn’t adjust so that you would be able to sit down, but these aren’t going to be as ergonomic as a standard office chair. What kind of chair should you use with a standing desk? As mentioned, if your standing desk doesn’t adjust then you would want to use a tall drafting chair to pair with your standing desk, however, if you have an adjustable standing desk like all of the aboved mentioned here, then you don’t have to do that. You can simply go with an ergonomic office chair of your choice. Another popular trend for people that use standing desks is to use an “active seat”. These could be either a balance ball or something a little more professional like a leaning seat. Can you add your own desktop to a standing desk frame? Absolutely. If you’re looking to get a full standing desk (instead of a standing desk converter) then the frame is usually going to be sold separate from the top and if you want you don’t have to use whatever desktop they recommend. This can be a great way to save costs if you just want to go with a cheaper tabletop. You can always upgrade later if you want to. The main issue you’ll have to deal with is that there won’t be preset holes aligned with your standing desk or may not be positioned right. But preset holes aren’t necessary at all and you can always just drill your own. At the end of the day though it may make things easier to get it all in one. What are the main benefits of a standing desk? A few of the primary benefits of using a standing desk are going to be less back pain, improved production, better posture, and increased circulation. Personally, I’ve noticed improvements in all of these areas. Other benefits aren’t as drastic, but I think if you want improvement with any of the above-mentioned areas then trying an adjustable standing desk is a good idea. Ok, so there it is. 2019 has an impressive amount of quality adjustable height standing desks. I listed 21 here but there are plenty of others you can always choose to go with as well. These are just my favorite and I think this list should give you plenty to think about and at the same time help you choose which is best. Good luck finding the best adjustable height standing desk for you! What do you think about the list? Are there any others you would include that I didn’t add here? Did this list help you? Let me know in the comments below! This is great idea! I don’t think I could have thought about this on my own. I sit around almost all day a week and I jog only on Saturdays. I never knew it isn’t enough. Now I know I have to get one of these for my office. My colleagues will greatly appreciate it. 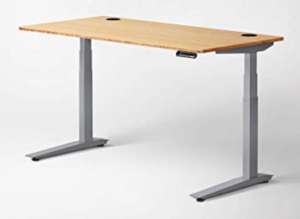 Personally, I’m considering the Cooper Standing Desk because it is cheaper and looks easier to maintain than the VersaDesk Power Pro Electric Converter standing desk. But it has less space but I think it is manageable because these two are just what I would prefer. This review article has been really helpful. The Cooper is an excelling standing desk to go with! Wow, thank you for this great resource! I can see you have really done a tremendous amount of research, and it’s wonderful to find such a thorough breakdown of the various options for sitting/standing desks. You cover a lot of different features of the desks – things I probably wouldn’t even have thought of – but that are important. Like how adjustable they are, how much space they take up, whether they will accommodate dual monitors, etc. And I really like that you provide a range of price options. Thanks so much for sharing all this helpful information! I’m glad you found this article helpful! Thanks for reading.